Darbs is originally from Fairhope, where she met Gabe years ago. He was the youth pastor at the church she attended. Last year, when she began classes at the University of Mobile, she was looking for something part time on the Eastern Shore, and Gabe thought she would make a great addition to the team…he was so right! 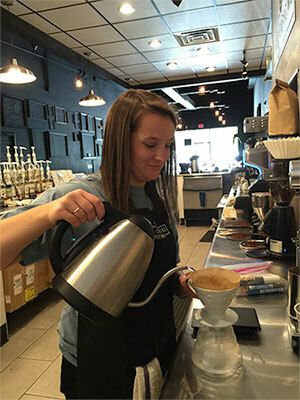 We are so blessed to have her with us far beyond making coffee (but she does make a mean latte!) At UM, she is studying sociology with a concentration in social welfare, and is minoring in Spanish. She hopes to go into social work. Favorite Menu Drink – It’s a tie between the Vanilla Latte and a Pour Over of our single-origin Costa Rican bean. Thanks for meeting Darby today! Come on by Soul Caffeine and say hello!